Five months have passed for us since we arrived in Chad, eight since leaving Canada. It may sound strange that we're just now starting to feel like normal rhythms are in place and that we're beginning to feel settled here in N'Djamena. The adjustment has been surprisingly and unexpectedly difficult for us due to many factors including health issues, environmental differences, language and technological challenges. I'm not writing this post to detail every tough thing we've been through because frankly that would be a depressing account and a pointless exercise in complaining. Just know that we've been buoyed through this time by the grace of our Father, the knowledge that we're being prayed for and the realization of the importance of the work we are part of here in Chad. 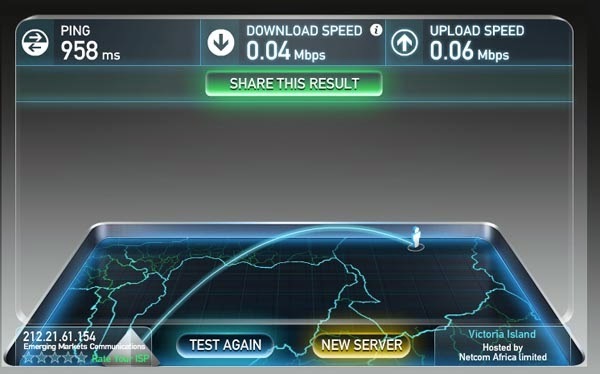 I must, however, take this opportunity to decry the abysmal state of the internet in Chad. 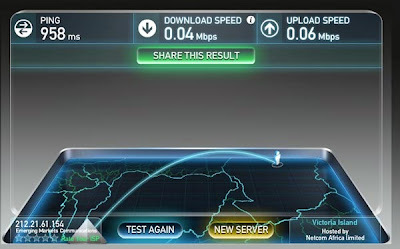 And to save a thousand boring words about how terrible the connection is here, I'll simply let you look at this internet speed test (http://www.speedtest.net/) that I was able to complete. The fact that I got to the end of the test to take this screen shot is amazing in itself. Incase these numbers mean nothing to you in the land of blazing internet speeds I will quickly replace them with numbers that you'd probably see if you did the same test yourself. 958 ms should be 1 or 2 ms - that's how long it takes for my computer to send and receive a simple "Hello" from the rest of the web. Download and upload speeds should be anywhere from 3 up to 15 Mbps depending on your monthly bill. The little stick man is me, in Chad, and that arch is my 'direct' connection to which ever company is providing my internet service - for you this connection could be as close as a few blocks away or, at worst, the next city over. Looks like I'm connecting to a provider on the coast! That's over 1000 km away. Joy! What would we do with faster internet? Skype with family and friends is pretty much top of the list. Update this blog more often is another. We'd love to see all those fun pictures you guys keep putting on Facebook and even add a few of our own. I enjoy sending videos too. That's been a thing of the past here though.